In the sample at the right I used red for the background and beige prints for Fabric A and Fabric B. I chose an additional floral print for the window panes. Cut 6 squares 2″ each and 8 squares 2 1/2 ” each. Cut the 2 1/2″ squares in half diagonally. Before you assemble the top, baste a floral triangle on top of each of the 3D triangles lining up the raw edges and centering the points. Assemble the top. You will have floppy triangles on top of each 3D triangle. 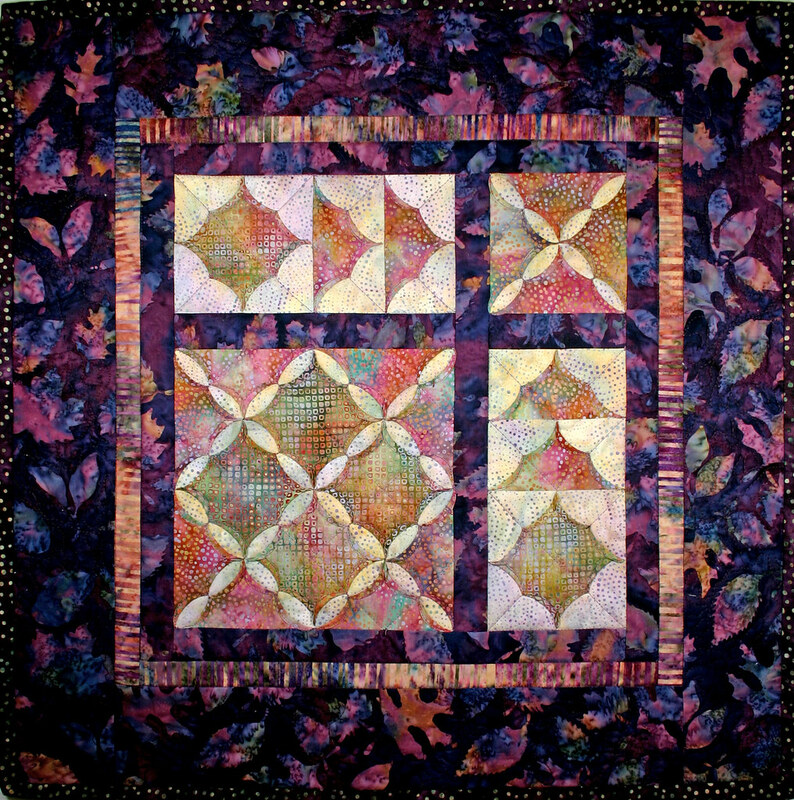 When you baste the quilt, center a 2″ floral square on top of each 3D square. When quilting eliminate the grid and just roll the bias folds over the raw edges and stitch them down by machine. Remeber to just stitch to the point where the folds meet, take one stitch across and then continue. It isn’t necessary to stitch the points. I will be at the Quilts Inc. show in Chicago so if you’re there please come by and say Hi! I will be in Monica’s Quilt & Bead booth. Thanks to all you who have been so supportive!! 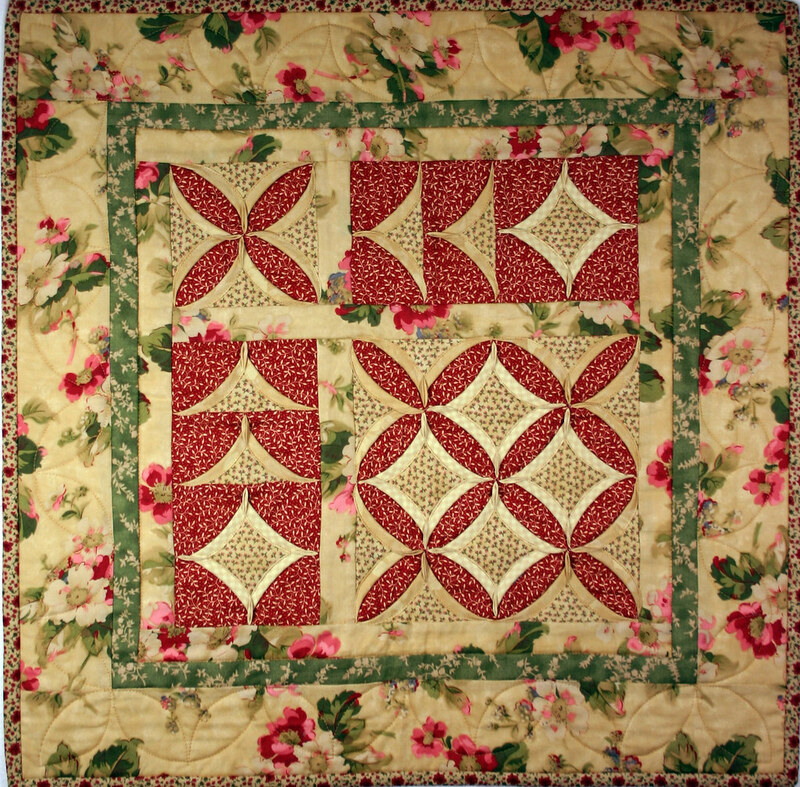 Hi Shelley, I love your quilt Flowers in Cathedral! I’ve got your book Machine-Stitched Cathedral Windows, I haven’t tried your method yet but did do a small sample of a different maybe the old method years ago and even won a ribbon as it was a quilt guild challenge. I keep studying your book and one day hope to find time to give it a try. Thanks for sharing and good luck at the show! I’m looking for the link to the Chicago show! Is it in April? Just checked out the location and I know the area! Easy to get to! !